Schlock-Wire: Shout Factory Saddles Up HARLEY DAVIDSON AND THE MARLBORO MAN On Blu-Ray In May – Schlockmania! If you want to ride their road, you gotta know their rules! 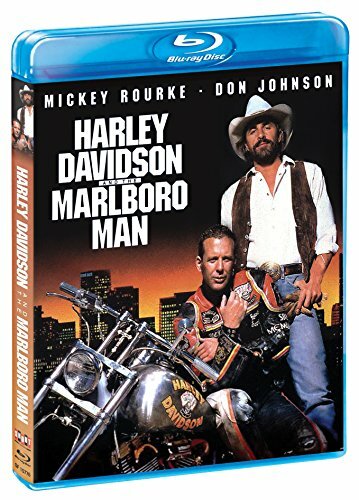 This spring, rev up your engines and get ready to relive the explosive action, daring stunts and high-octane thrills when the 1991 action smash hit HARLEY DAVIDSON AND THE MARLBORO MAN arrives for the first time on Blu-ray on May 19, 2015 from Shout! Factory. When their favorite bar is threatened with closure, outlaw biker Harley (Rourke) and modern-day cowboy Marlboro (Johnson) hatch a scheme to save the day – by robbing the corrupt bank behind the bar’s shutdown! When the robbery yields not money but a shipment of drugs, Harley and Marlboro find themselves on the run from the bank’s sinister president (Sizemore) and a posse of seemingly unstoppable hit men. Now wanted dead or alive, the hard-riding heroes must fight for their very lives… and learn that when the going gets tough, the tough take the law into their own hands. 1080p High-Definition Widescreen /DTS-HD Master Audio /1991/98 mins.